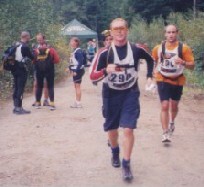 West Coast Adventure Race (WCAR) will challenge your mind, body and soul while exploring the magnificent BC nature. 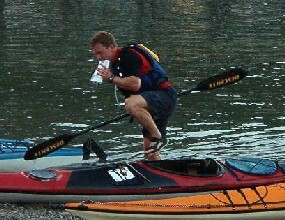 The race comprised of mountain biking, navigation, kayaking, trekking and trail running. Sprint Adventure Race - 4 Hours - mild endurance and technical level. Vigor Adventure Race - 8 Hours - ideal challenge to test your personal and team strengths. Enduro Adventure Race - 24 hours - overcome your limits by completing the ultimate challenge. 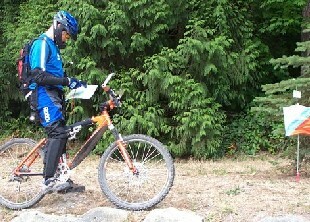 The First Canadian Mountain Bike-Orienteering Challenge (MBO) is about to take the Lower Mainland by storm on May 16, 2004. MBO combines the excitement of downhill racing with the endurance of cross country cycling. Experience the thrill of finding the best way by navigating your course, matching the map to the ground and correctly interpreting the maze of trails. Discover the thrill of Adventure racing and Mountain Bike Orienteering in fun and non-competitive way. Try Sprint Adventure race (4 hours) and the Short MBO course (12 km) on your own pace, even if you have no experience at all. A perfect opportunity for the entire family to explore the outdoors and be challenged as a team. FREE for team members younger than 14 years old! Maple Ridge and Mission, BC - about 60 km East of Vancouver! The event centre (Start, Finish and the central transition area) are at Hayward Lake, about 45 min. to 1 hour drive East from Vancouver. The First Canadian Mountain Bike Orienteering Challenge starts May, Sunday 16th. Check in 9:15 at ALCOO PARK (Maple Ridge) form Dewdney Trunk take 248 North. The park is located at Alqette Road. Follow signs to the Star Location. Technical Meeting at (9:30) All must Attend!!! Sorry we were not allowed to use the newly mapped area with Mountain Bikes. Expect horses, motor bikes and perhaps 4x4 off road trucks in the forest...well that's the reality. Designed to challenge, invigorate and inspire, this multi-sport event tests competitor’s endurance, intellect and techniques. The West Coast Adventure Race offers a selection of different route choices between control points and requires participants to make their route choices based on physical and navigational abilities. The detailed event program can be found here. 2004 UOA seasonal pass. It gives you 15% off all UOA events and free entry to all 12 Thursday evening Urban Orienteering Adventure Races. Free Entry to Brandywine O' Challenge. Many prizes donated from our sponsors. At least one assistant per team, with one car is suggested. The assistance / support crew plays an important role in the team's success. They take care of food, preparation of equipment, getting everything ready at the transition station and must be present there to assist their team. All sections comprise control points (CP) which are indicated on your maps as circles. It is mandatory to pass all these points, and with the whole team at once. Some control points are also medical points (CM). The teams must stay together throughout the entire race or within voice range of each other at all times. Participants in 24 Hour Race will be required to plot their UTM coordinates. The accuracy will be checked before start and penalty points assigned for misplaced CP. Come to our free Wilderness Navigation one day course on May 1 or May 9 and you'll learn well how to plot. There are different route choices between control points (CP). You must make your route choices based on your physical and navigational abilities. You will not always be traveling over well-marked, well-worn trails during the West Coast Adventure Race. We have a limited stock of various boat designs for rent, so if you need a boat please arrange it as early as possible to avoid potential disappointment. 1. Boats will be rented on a first payed, first served basis. 2. Boats will be confirmed when payment is received. 3. Full Payment must be received by May 12th, 2004. 5. Any damaged or lost gear will be charged to the renter at full retail price. 6. There is a $10 clean boat fee if boat is brought back dirty. The renter has the option of cleaning the boat here to avoid the penalty. The map scale is 1:20 000 with contour intervals of 20m for the WCAR and MBO events and 1:10 000 with contour intervals of 5m for the Night O' Event (Fundraiser for BC Junior orienteering team) on Saturday night. 4h race you'll get Introduction to Orienteering workshop on May 1, May 9 or May 14.